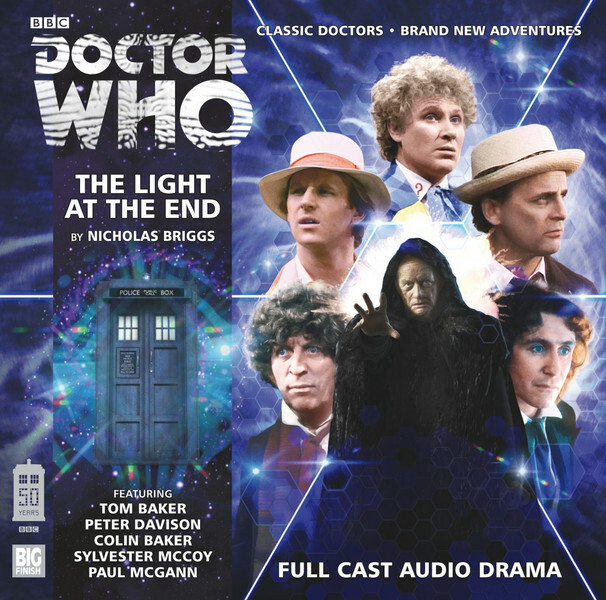 Big BIG FINISH Week: Doctor Who - THE LIGHT AT THE END Review | Warped Factor - Words in the Key of Geek. Dr. Moo celebrates fifty years of time and space. In those in-between years Doctor Who was not the international phenomenon we know it as today. It didn’t have mass appeal, it didn’t air new episodes, and if you liked it you kept it quiet lest you become the subject of ridicule. When it returned in 2005 under the hit-or-miss guiding hand of Russell T Davies it became huge in the UK and began to expand worldwide becoming one of the BBC’s biggest show, something that has since increased under the watch of Steven Moffat and it looks set to continue that way when Chris Chibnall takes the helm after him. But there was one way that fans could still get their fix before Davies showed up and that was Big Finish Productions. Producing new stories on a weekly basis, they brought back the old Doctors for new adventures. They redeemed some characters, expanded others and even created totally new ones – and they’re still at it now. Come the show’s fiftieth anniversary celebrations in 2013 it would have been nothing short of a travesty had they not done something to mark the occasion. That’s where The Light At The End comes in. This was a one-off special that saw the first eight incarnations of the Doctor coming together for a big adventure as they fight off the Master, with Geoffrey Beevers reprising that role once again. It starts off simple enough with the Eighth Doctor and companion Charley in their TARDIS seeing a warning light. Nothing out of the ordinary so far… except that this is a light that the Doctor insists had never been there before. Before too long we swiftly see this same situation happening for the Seventh, Sixth, Fifth and Fourth Doctors as well. As a multi-Doctor story featuring no fewer than eight incarnations you’d be forgiven for wondering whether any of these eight get the short shift. I’m pleased that I can say no such injustice occurs! All eight get a decent amount of airtime – while the first three do get less exposure what they get is absolutely essential to the plot and is satisfying – and writer Nicholas Briggs finds interesting things for them all to do. It does take a little while for all of the Doctors to get going but when they do the fun can begin! Bringing the Doctors together does come at a cost when their companions get written out fairly early on but you can hardly fault the story for focusing primarily on the Doctor’s many selves. The Master’s plot similarly gets a lack of attention to detail but the concepts in play here are interesting and Beevers sells it with ease. Really his character’s plot is there simply to bring together the eight Doctors and that’s the true strength of the story. Having these characters all come together and interact is what the story exists to do and so we get some wonderful fan-pleasing moments. Having the 4th and 8th Doctors share a TARDIS is a particular highlight and the chemistry between Paul McGann and Tom Baker is like music to the listener’s ears. Sadly the interactions between the eight Doctors are not as developed as one may hope – I could have done with some more bickering for a start – but what we have is great stuff anyway. Hopefully there will be more stories like this in the future. One other thing of note is how the first three Doctors are utilised in the story. While all three are in basically a supporting role (tellingly these three are the only ones not seen on the cover) they are a welcome presence. Frazer Hines comes out of this best of the three with an incredibly convincing Patrick Troughton impression but William Russell’s First Doctor is pretty wonderful too. Tim Treloar’s take on the Third Doctor is not quite there but Jon Pertwee had such a unique voice that I have trouble imagining anyone could do it better and he has since gone on to work with Big Finish again. I’m not sure that anyone could ever do what Pertwee did but Treloar is the best we’re likely to get. Ultimately what we have with The Light At The End is a surefire crowd-pleaser of a story. It serves its purpose of celebrating fifty years of Doctor Who with a focus on the classic era and brings together eight different Doctors in a single story. That the story is actually very good in its own right is a bonus! As anniversary specials go I’d cite this as my personal favourite one – yes, I did just call it better than The Day Of The Doctor – and if you haven’t listened to it I would highly recommend it.